It has been nearly five centuries since humanity found a way to eliminate all emotions except fear. No more anger, no more hate, no more ambition, no more violence, no more war. But at what cost? For along with no "negative" emotions, all the "positive" emotions, including love, joy and hope, have been eradicated from the world. The result: a world without war, but a world that is dead, for emotions are what make us truly alive. The characters are not zombies, but they truly are the walking dead. 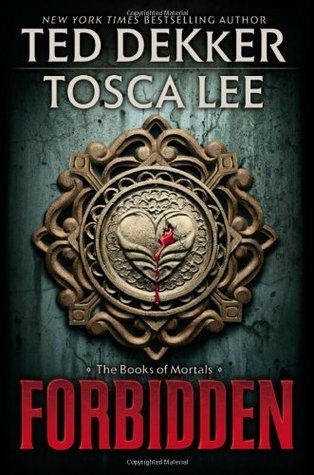 This is the world brought to us by best-selling suspense/fantasy writer Ted Dekker and his co-writer Tosca Lee in "Forbidden," the first book in a new series "The Books of Mortals." If you've read my blog at all, you know I love Ted Dekker's books. I have yet to find a Ted Dekker book that I don't enjoy. I've never read any of Tosca Lee's novels, but I have heard only good things about them. After reading this book, I can see why. Her style and unique touches blend well with Dekker's style to create a possible medieval future world that feels all too real. In this world, The Order controls everything and sets the rules for all of humanity. In place of emotions, they have provided a sense of, well no pun intended, order that makes the populace feel safe. A young artisan named Rom is awoken from his emotion-less slumber when a crazy old man hands him a vial and a cryptic message on vellum. Within the vial lies the secret to emotions. Rom impulsively drinks the contents of the vial and immediately notices a change. A wave of emotions that he has never experienced washes over him, confusing the young man. Suddenly, the world is full of color and light. He quickly discovers that he can use these emotions for good, unlike the son of the Sovereign, who has manufactured a way to feel emotions and uses them for selfish, ambitious reasons. Rom and his companions undertake a quest to find and protect a prophesied boy who will change the world. Collaborating as writers is no easy task, but Dekker and Lee make it work to their advantage. Dekker continues his obsession with darkness and light, good and evil, and Lee contributes her realistic descriptions of gritty violence and deep emotions in a way that truly pulls you into the story. Together, they remind us that, while emotions may have negative consequences when not handled properly, emotions are a big part of what makes us human and what life is about. Without love and hope and trust, humanity may as well be dead. With a series of plot twists and turns, Dekker and Lee guide us through Rom's journey from death to life and set up the future of the series with an interesting ending. "Mortal," the second book in "The Book of Mortals" series, is scheduled to be released June 2. Thank goodness that is only 84 more days. Not that I'm counting or anything. On a scale of 1 to 5, I give "Forbidden" a 4.5. Sign into Goodreads to see if any of your friends have read Forbidden.